Parmigiana is always a favourite. 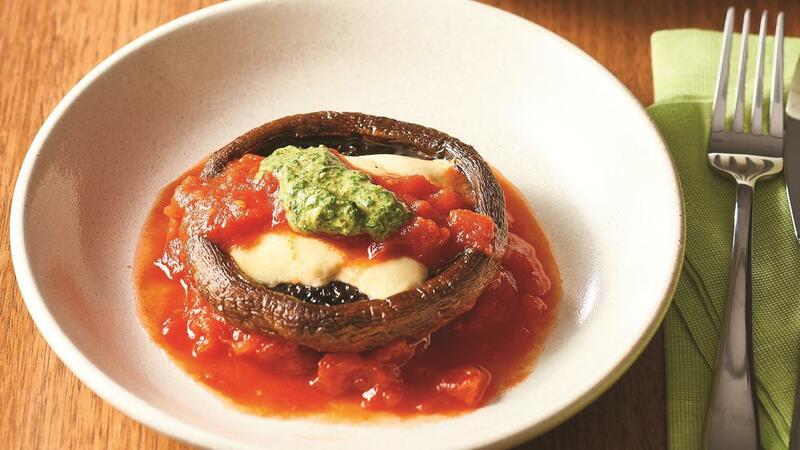 Using mushrooms instead of meat allows vegetable lovers to enjoy this classic dish. Remove stalks from the mushrooms and place cup side up on a large cooking tray. Drizzle with oil and bake for 20 minutes at 160C until soft. Continue to bake for an additional 10 minutes at 160C. Add pesto and bread crumbs. Heat KNORR Pronto Napoli and pour as the base sauce on the serving plate. Add the cooked mushroom and sprinkle with toasted breadcrumbs. Serve with KNORR Instant Sweet Potato Mash and a green salad. Tip – Use removed mushroom stalks in soups or casseroles.